After has disappeared for a good number of years, Voxan has decided to reenter in the “race” of motorcycle manufacturers. Therefore it developed an entire new motorcycle which has all it needs to take your breath away. 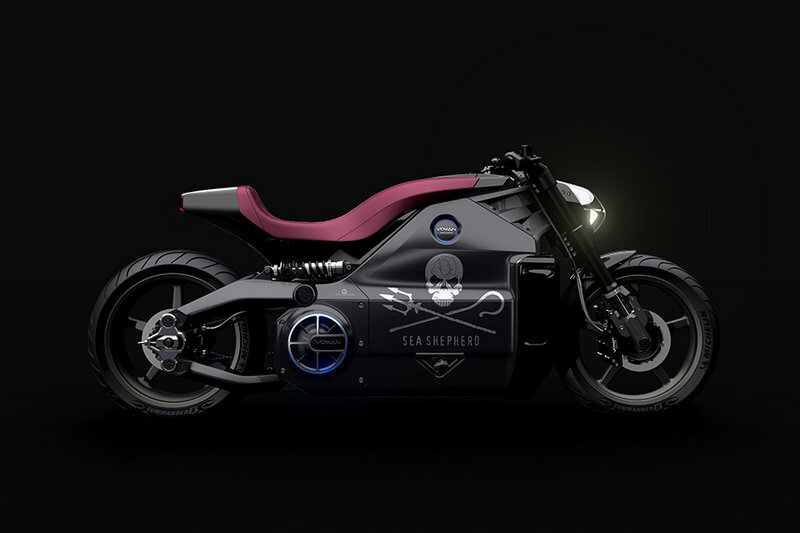 The new bike was designed by Sasha Lakic, is entirely electric and has managed to take everybody by surprise when it made its debut at the Paris Motorcycle Show on December 2nd. It is called the Wattman and currently is the fastest electric motorcycle available on the open market. This electric beauty weighs 350 kg and at its heart lies an electric motor with permanent magnets and liquid cooling, that puts out a maximum power of 200 HP with 200 Nm of instant torque up to 10,500 rpm. This power is enough to send you to 100 kmph in only 3.4 seconds which is fairly impressive for an electric motorcycle. Another impressive thing is the motorcycle’s architecture, as the new Wattman features an innovative exoskeleton which contains the battery, motor and cooling systems. You also get carbon wheels, a 240mm Pirelli Commander II rear tire and a 12.8kWh battery that can be charged to 80% in 30 minutes. Hit the jump for more information on the 2014 Voxan Wattman. Voxan has today achieved a major revolution in French motorcycle history with the presentation of a 200 HP upscale machine which is radically innovative in its technology and its architecture. WATTMAN illustrates the new techniques and stylistic direction of the brand with avant-garde technologies in the field of electric mobility and a design that anticipates the shape of bikes to come. Powered by the first Voxan electric motor with permanent magnets and liquid cooling, WATTMAN delivers a phenomenal power of 200 HP with 200 Nm instant torque up to 10,500 rpm. It is positioned as the most powerful electric motorcycle ever built, at a much higher level of performance in many respects than the best combustion motorcycles. WATTMAN is engineered in Monaco and made in France Voxan Wattman. The power is transmitted to earth by a 240 mm wide tyre, reaching 0-100 kph in 3.4 seconds and 0-160 kph in 5.9 seconds. Synonymous with new sensations, WATTMAN offers driving pleasure in its purest form, equally capable of lightning acceleration and flexibility, thanks to its belt drive electric motor. The new VOXAN features an exceptional charging time of 80% in less than 30 minutes thanks to a “COMBO II” socket, the European quick charge standard. This is less time than it takes to recharge a mobile phone. It can also be plugged to a standard household socket, anywhere thanks to its integrated charger. Its ultra-compact 12.8kWh battery ensures 180 km of range. Such an Ultra High Tech object or work of modern technological art draws its inspiration from the future to exist in the present. Voxan inaugurates a new motorcycle architecture radically looking to the future with an aluminium “exoskeleton” chassis housing integrating all the components of the powertrain. It is accompanied to the rear by a new type of parallelogram-shaped four-link suspension (two dual oscillating arms) that creates an extension of the battery pack towards the rear axle. This horizontality gives the bike stability and elegance. This results in a very pure motorcycle without visible technical features. The markers of old generation motorcycles have disappeared in favour of a new, quieter, more technological yet equally emotional approach. Some essential commonalities nevertheless exist between these two generations of motorcycles: the pleasure of driving, the sensation of extreme acceleration, the intoxication of freedom and of nonconformity, the unique pleasure of the fusion between man and machine and a pleasure that only a motorcycle with a strong personality can provide.